New Years Eve. The year is over. It is necessary to celebrate with an American craft beer that would send the year off with a bang. Oude Tart by The Bruery, from what I understand, is a one-time release that could only be picked up a the brewery. Does it come out annually? I believe it is aged some eighteen months. The funk of the beer seemed to arise from some type of Brett inoculation as there are barnyard and earthy aromas and flavors. Cherry dark fruit adds complexity while there is tart rather than sour tones. Quite a nice drinking beer, mildly dry, that kept the senses wanting. Nicely done. Enjoy! Useless Fact: A ‘jiffy’ is a unit of time for 1/100th of a second. Yesterday was basketball while today brings on the eve of the end of the week while getting together with the Thursday night American craft beer group. Steve made his first appearance in several months. I let him know that the 1st of December will be my last beer in this year long adventure and that I would make it worth his time to show up for the celebration. This isn’t a detailed preview of what we will have on that evening but what American craft beer found it’s way into my belly for number 351. Provisions Series – Tart of Darkness by The Bruery came by way of a transaction a month or so ago. An American Wild Ale, Tart of Darkness name does not mislead. A mellow stout makes up the backbone while a sour cherry assaults boldly. The low ABV, 5%, makes this a very easy drinker while the balance of tart and underlying stout make for a wonderful bouquet and all around beer. Nicely done. Enjoy! Useless Fact: One-fourth of the 206 bones in the human body are located in the feet. Lately, long hours at work have consumed me to the point were I feel like a walking zombie. Monster has become my best friend, trying to reason with my eye lids to stay open in spite of being so much more comfortable closed. In my sleep deprived state my mind has wondered to the point of knowing that I have gained a lot of weight, since starting this 365 days of American craft beer, trying to figure out how I might solve this problem of the emerging blimp. I started working out but my mind slipped further to the point of suggesting I should take the month of December off from reviewing beers. See what the lack of good ole malt will do to my waste line combined with a few extra minutes on the elliptical. Luckily not too many people read this blog or word could get out and I might find myself committed. Of course I managed my way to American craft beer 323. 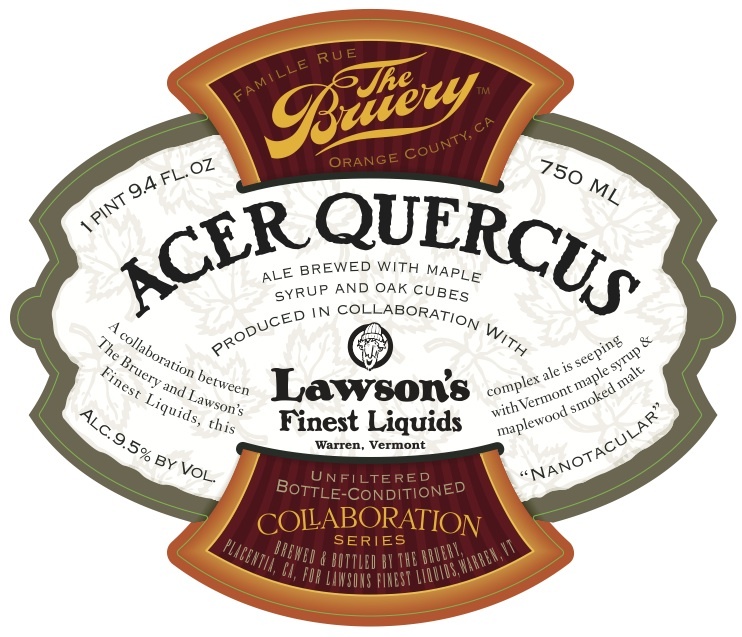 Provisions Series – Bierbauch by The Bruery is their version of a Maibock. I have to admit that I am not much of a lager fan but Maibocks are one of the few exceptions. Bierbauch is finely crafted, enlightening the senses with typical Maibock aromas and flavors, while adding a touch of vanilla from barrel aging. Alcohol comes through but not enough to deter. Very nice. Today I will leave you with a quote: “There is more refreshment and stimulation in a nap, even of the briefest, than in all the alcohol ever distilled” – Edward Lucas (obviously this guy wasn’t drinking good beer, but it feels right at the moment). Enjoy! Useless Fact: The very first bomb dropped by the Allies on Berlin in World War II killed the only elephant in the Berlin Zoo. I wish I had more family that lived in American craft beer hotspots that were willing to allow me to appreciate beer from their nape of the neck. Russ, my most excellent cousin from California, is an American craft beer convert and frequently goes out of his way to try new beers while teasing me with photos from his excursion. The good news is there is usually beer for me surrounding those side trips. The most recent netted me several different bottles of The Bruery beers that I cannot get locally. Because the beers are all in 750ml bottles, I try to wait for a weekend were I have some time to put that much liquid into my belly. Acer Quercus is a collaboration beer with Lawyson’s Finest Liquids that has been aged on oak cubes. Exactly my type of beer. The 9.5% alcohol weighs in lightly but when you down the 750 in less than 45 minutes, it weighs heavy on your feet tingling. I really liked this beer but thought the aroma could have used a boost. Nonetheless worth your time and taste buds. Enjoy! Useless Fact: Greyhounds have the best eyesight of any breed of dog. The Bruery started distributing their American craft beer to Illinois probably eighteen months or so ago now. When they first did, only a couple of their year rounds were available and as time went that group of beers increased to even include a couple of one shots. The hype was big when they first broke into the market. In spite of their $10 or more per 750ml cost, they didn’t last long. I caught the fever myself. I purchased everything they threw our way, but, for some reason, I really didn’t review them. I held them in higher regard. I have had a few of their beers at get together with other beer guys but never cracked the few bottles I have had. In the back of my head I have been deciding on a “Bruery” night to try all these beers. Still haven’t decided when but yesterday was the day to have a beer, having enough time to down a 750 by myself. Saison Rue was the chosen and is probably a good fourteen months old. I obviously don’t know what this tastes like fresh but the cellared version is outstanding. Farmhouse ales are another one of my favorite styles as I appreciate the subtle complexities and tartness. I will be on the prowl for another bottle, looking forward to a fresh take on this beer. Enjoy! Useless Fact: President Taft weighed 352 pounds. 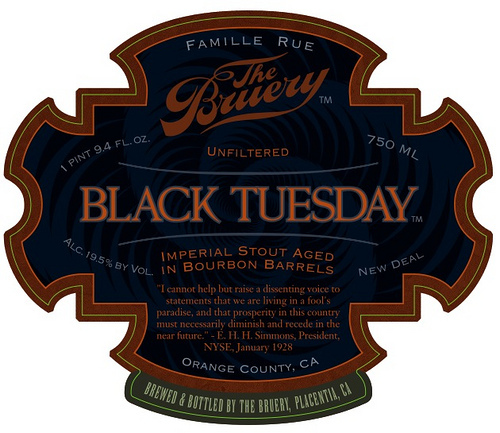 Black Tuesday, by The Bruery, is currently one of those American craft beers that is highly sought after. I have often wondered if I would have in my cellar what it takes to land one of these. Recently, with the 2010 release, they had a few they were selling via their website after the initial release. I had it all lined up that my cousin, who lives in California, would travel to pick up the beer. Based on what I thought I read on the site, the beers would go up for sale at 9:00pm. What a goof. I was 9:00am, completely shutting me out of a real chance to pick up the beer. Well last night was TNBC at my house and Mark brought along Black Tuesday ’09. He has been trying to get us to drink it for several months. I guess it isn’t a beer that has to be forced on many. As our last beer of the evening, after a list of big beers, we decided to partake. The aroma of this beer is special, inviting, and an overall joy for the snozola. Chocolate, almost creamy like, starts off over the top of a blend of dark fruits, molasses, and dark malts. Time spent taking the aroma in for Black Tuesday is time well spent. The taste is right up there to. Each sip brings out another layer of the delectable beer. The large, creamy body seems perfectly placed for this beer too. In spite of the alcohol (19%) it was very noticeable. Just an outstanding beer that I know want again and again and again. If you have the means to obtain one, please do as you will be doing beer consuming senses a favor. Enjoy! Useless Fact: Canadian researchers have found that Einstein’s brain was 15% wider than normal. In selecting American craft beer to bring to a family get together there are always some limitations to what I feel I can bring. I am always saddened when I see a cup or glass that doesn’t get finished by a Lite fan that would be greatly appreciated by someone like myself if they would have just passed instead of feeling they have to try. Deliverance was the beer my wife asked for as she wanted a bourbon beer. Didn’t write up a review but that is some fantastic stuff. Tyranena was brought for my own self indulgence while the Three Floyds and The Bruery were there in honor of the season. I ended up having about 85% of the 3 French Hens so I decided to make it my beer of the day. The pour was what I expected with a dark ruby hued beer capped by an off-white, almost tan head. Taste and aroma were both good but neither was really big enough. I don’t bold and over the top but I want enough aroma that I don’t have to submerge my nose to get anything. The body was also a bit light. Now that might make it seem like I hated the beer: I did not, if those items were ramped up a bit, it would have been outstanding. The lingering question: How will this last nine years? Enjoy! 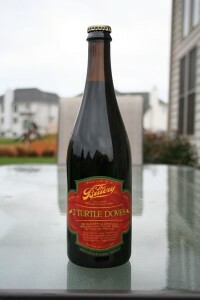 After 10 days of no beverages, I turned my attention to a new addition to the collection: 2 Turtle Doves by The Bruery. 2 Turtle Doves is a Belgian Dark Strong Ale in which they have thrown in toasted pecans and cocoa nibs. Try to get some if you can. If you can only get one, the biggest decision will be to open or to cellar. No matter, you will not be disappointed. Cheers to hoping that each beer will only improve on the last. Enjoy! The beer store different disappoint as there were some good new beers and even a new American microbrewery distributing to Illinois now. Yes, The Bruery is now selling its goods to the Land of Lincoln. I have heard and read good things about their beers. I had my first, Trade Winds, at the most recent TNBC meeting. I picked up a bottle of 2 Turtle Doves but will be back for Orchard White, Rugbrod, and Saison Rue. My biggest complaint each week of visiting the beer store: I never have enough money to afford everything I would like to get. Enjoy!